A zoonosis is any disease or infection that is naturally transmissible from vertebrate animals to humans. Animals thus play an essential role in maintaining zoonotic infections in nature. Zoonoses may be bacterial, viral, or parasitic, or may involve unconventional agents. As well as being a public health problem, many of the major zoonotic diseases prevent the efficient production of food of animal origin and create obstacles to international trade in animal products. As I was doing an A to Z project on agriculture, I felt sure I’d go with the straightforward zucchini or maybe zero tolerance for the letter Z. Then I stumbled into zoonoses and BAM! I needed to write about that. Well, if I could figure out what to write. Hope I do the subject justice. I tell folks regularly that I love agriculture but until a few years ago, I had always been a crop person. In the last few years I have learned a lot about livestock and good animal husbandry from friends who farm. But as I looked into z words, zoonoses triggered something in my brain (no worries it isn’t naturally transmissible to those of you reading this blog). See, Seth took that job as avian flu was a big concern. It was a time when folks like me who love to travel around the world were being more cautious. Extra shots for various things didn’t seem as big of a deal and we wished there were shots for avian flu. We also weren’t sure whether we could get medicines while traveling in other world areas so before we went to the airport, we’d get prescriptions and held onto them. All the while, Seth was one of the front line forces in monitoring diseases that may move with wildlife migration, how those animals could cause problems for farms and ranches and potentially for people too. As I looked around for zoonoses resources online, I actually found some research Seth compiled on feral hogs. So the wild pigs that run around…. if you aren’t familiar with them, count yourself lucky. Those are some mean sons of guns. In the Delta, I heard of people being chased up a tree by the darn things! Well Seth and some colleagues wrote a paper about a program they had to monitor feral pigs, diseases carried and their proximity to livestock, etc. It is the kind of thing I never had thought of until Seth took that job. What’s cool as I looked though the info, it seems Seth and the experts agree that the US has a vigilant program that has done well staying on top of these potential threats. Emerging zoonotic diseases have potentially serious human health and economic impacts and their current upwards trends are likely to continue. Examples are avian influenza, Bovine Spongiform Encephalitis (BSE) and the Nipah virus. Some of the “lingering” zoonoses are re-emerging in some regions, although they seem to attract less public awareness. Brucellosis, dog rabies and parasitic diseases such as cysticercosis/taeniasis and echinococcosis/hydatidosis for example. Many factors lead to the emergence of zoonotic diseases. Environmental changes, human and animal demography, pathogen changes and changes in farming practice are a few of them. Social and cultural factors such as food habits and religious beliefs play a role too. via WHO | Emerging zoonoses. Like I said above, vigilance seems to be a key factor in US disease prevention efforts. Ryan Goodman wrote a little about one of the disease issues that was being watched in Arkansas. It’s of great importance for us to spread the word about the spread of trichomoniasis in Arkansas cattle herds. 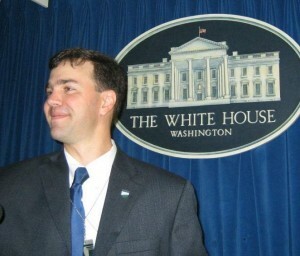 I learned of the issue at a recent Livestock Marketing Association meeting and plans to act by the state Vet’s office. As described in the news reports, if an infected bull breeds cows, the cows can abort 40 days after mating, and carry the disease until cleared. However, the bull will carry the disease for life, requiring his removal from the production system. This early term abortion can reduce a cattleman’s 90% calf crop to 50% within one year. For someone who only gets one paycheck annually (selling calf crop), that’s a HUGE shot in the bank account. Many small producers in the state cannot suffer these losses. This underlines the importance for Arkansas cattle producers to test newly purchased bulls before introducing into the herd, and stopping trich in its tracks before it costs our industry thousands. via A Steer, is a Bull, is a Cow: Cattle Production Gets Trichy | Agriculture Proud. So, you see, we’re in a tough spot. If we don’t feed the deer, they will get sick and die. But may expose our cows to all sorts of unwanted stuff. 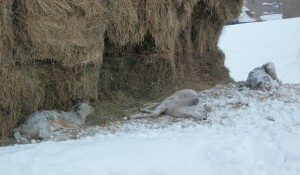 If we feed the deer, they won’t leave, and could still get sick and die. And we will still have exposure to whatever it is they are carrying. We have already spent money on buying panels to place all around our feed, such as the silage that we cut and the freshly-ground hay. Game and Fish suggest that we space our hay stacks closer together, but our insurance insists that our hay stays further apart. I personally don’t believe that where our hay is located would make much difference to this large number of animals. The amount of money that has been lost through the hay and feed that has been destroyed is almost nauseating. But the danger to the health of our herd is what has us the most concerned. We are doing all we can to protect our livestock, but it would be nice if there was a better system in place to assist producers that come across these issues. via Ever increasing problem | Wag’n Tales. And I remember what all I went through when I visited my friend Chris Chinn’s farm. 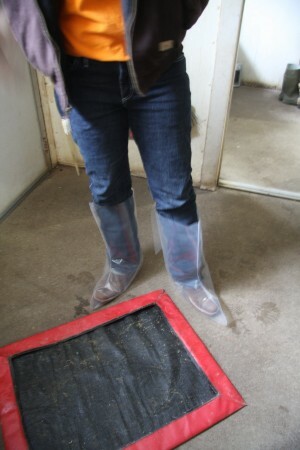 When we went to the barns, we had to disinfect our boots before we could go in and then had to wrap them in a sleeve. Antibiotics are just one of the tools we have in our tool box; we don’t rely on them as part of our daily care plan. On our farm, we work hard to prevent problems from occurring, that’s why we are so strict about protecting our hogs’ environment. We wash and disinfect our barns on a routine basis for prevention. (Plus, we like working in a clean barn too.) Our sow barns are washed weekly (these barns house the adult females that will give birth to piglets). And each sow (a sow is an adult female that has given birth before) is bathed before going to the farrowing barn where they will give birth. Our gilts are also bathed before farrowing – a gilt is a female hog that has not given birth before. We do this to prevent infection during the birthing process and it also relaxes the sow or gilt and helps keep them comfortable. We also wash and sanitize our nursery barns and finisher barns before every new group of pigs arrive to the barn. via There Is No Health Insurance for Pigs | chrischinn. My friend Seth tells me there is nothing for farmers or consumers to be afraid of and awareness plans and programs are successful like the one with feral pigs. Since Seth is certain wildlife and agriculture are able to coexist and even thrive side-by-side, I am too!